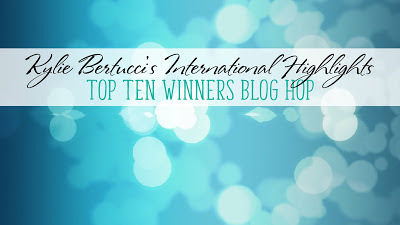 Today I am participating in the top ten winners blog hop which was held in May. Thank you so much to everyone who voted for my card allowing me to participate again. The theme for this hop is the same - Encouragement. I tried something new for this project and used bubble wrap and two of my favourite new in colours to create the background. For my card base I have used Blueberry Bushel. Such a beautiful blue - it reminds me of sapphires. I stamped with the bubble wrap using Call Me Clover and Blueberry Bushel. I then used an aqua painter and wet a few of the bubble circles to add some solid colour. The stitched shape circle has been cut out in gray granite. The little rhinoceros was stamped using memento ink on whisper white cardstock and coloured with stampin blends. The banner with 'awesome' stamped on it is from pick a pennant stamp set, stamped in smoky slate. 'You're' is from thoughtful banners. The little rhino is also stamped on the inside of the card and coloured. All stamp images © 1990-Current Stampin' Up! All content including text, photographs and graphics © 2007-Current Shelly Wadge . The content of this blog is the sole responsibility of Shelly Wadge - Independent Stampin' Up! Demonstrator and the use of and content of the classes, services, or products offered are not endorsed by Stampin' Up! Thank you.